In today’s world “Work-Life Balance” is an impossible fairy tale. If we are honest with ourselves, all we can strive for is successful “Work-Life Integration.” I say this because work-life balance implies that what you do professionally and what you do personally are somehow at odds – a zero-sum game that requires us to strike a 50-50 balance. Work-life integration, by contrast, suggests that at the very best, what you do at work and what you do outside of it with family, friends, and community are driven by the same fundamental values and priorities. Ideally, you can bring your talents, strengths and personality to both arenas, making one’s work life and home life parts of a seamless whole. Then you find ways to fulfill and enjoy both your work and life demands at the same time. Work-life integration isn’t just about finding time at home to do work tasks and handling home tasks at work, even though that’s a popular perception. Instead of thinking “what work can I easily integrate into my home life”, focus on how you can integrate all areas of your life the best way you can. The ultimate goal is to optimize how you use your time so you can fulfill all of your daily needs, both in your work and in your personal life. This is where GTD is so critical and I see many people make the mistake of setting up separate systems. Don’t attempt to separate your trusted systems into work and personal systems. You just have your life and all the associated commitments and stuff in your life, so you need a single trusted system. However, you should separate your contexts – what you can only do at the office and what you can only do at home when defining your next actions. That way, you only scan your next actions that are appropriate to the context of where you physical are at any given time. If your trusted system up to date it is easy to leave work every day and feel like you accomplished exactly what you needed to do for that day. This allows you to drive home and decompress by tuning out and watching TV, reading a book, or whatever activity you like to do to relax and refresh. The ability to forget all the things you didn’t do that are still on your plate is essential to relieving stress and feeling like you are doing the appropriate things given your available time and context. I recommend you do a “Daily Review” at the beginning of each day at the office. First, look at your calendar to see what hard commitments you have and how much discretionary time you have. Then, look at your Office Next Action list and decide what you realistically want to accomplish before you go home. I stress the realistic part of this. Assign a “Today” tag to the next actions you want to accomplish today. Then filter your next actions on TODAY so you only see those items you decided you want to accomplish today. Once you can check off or delete all those things that you set out to accomplish in the morning at the office, go home. That way, you can feel good about accomplishing what you set out to accomplish at work and go home to be with your loved ones and focus on the priorities in your non-work life. Many people (either consciously or unconsciously) try to keep track of everything they need to do in their mind, which is a big mistake. Our brains are optimized for fast decision-making, not storage. Trying to juggle too many things in your head at the same time is a major reason we get stressed out when there’s a lot of stuff going on. The best way to stop mentally stressing and start being productive is to get all your “stuff” into your trusted system. David Allan defines “stuff” as: “anything you have allowed into your psychological or physical world that doesn’t belong where it is, but for which you haven’t yet determined the desired outcome and the next action step.” (page 17 of Getting Things Done) So, when we have stuff in our heads, it causes untold stress and anxiety. Once the information is out of your head, it’s far easier to figure out what to do with it. I recently ran across an old friend who uses OmniFocus as the basis of his trusted system and he wanted to know why I used Evernote instead of OmniFocus. Choosing a tool for your trusted system is a personal decision and analog, digital and hybrid systems can work. Many people who are Mac-centric use OmniFocus and are extremely pleased with how it works for them and since it is designed with GTD in mind it makes it easy to follow GTD methodology. So, what exactly is a trusted system? We all use trusted systems today and probably don’t know it. Your calendar is a trusted system. Once you put a meeting or appointment into your calendar your brain “lets go of it” and no longer keeps it in your subconscious. Why does your brain “forget” that meeting or birthday? The reason is your brain “trusts” your “system” (calendar) to remember it for you. Same thing goes for todays Contacts Apps for your names, addresses, phone numbers, email addresses, etc. Calendar and Contact apps are specialized trusted systems for specific uses. In GTD you also need a general-purpose trusted system for all the other “stuff” in your life. My trusted system must be 1) easy to use 2) with me at all times 3) on all my devices. It must be able to provide friction-free capture of the incoming stuff that comes to me. It must be able to retrieve the relevant information I need at a moments notice. It must be able to handle digital and analog inputs depending on contexts. And most important, when building a trusted system, simplicity is the key – less is more – and that is why I use Evernote. Evernote serves as the foundation for my trusted system because of its friction-free input and output of data. It is always available and I can easily access it from whatever device I am using. It syncs across all my devices so it doesn’t matter if I am on my laptop, my home computer, my smartphone or my tablet because I can easily get information in and out of Evernote. Evernote’s ecosystem of applications allows me to fine-tune how I use it for capture. I use a Fujitsu ScanSnap scanner to scan all physical paper directly into Evernote. I use Fast Ever to capture text-based stuff in a friction-free manner. I also use the Evernote Web Clipper to clip web pages into Evernote with one-click ease. I have 16 “Notebooks” which are the collections of individual notes. I also have two “Stacks” (Next Actions and Reference) that are collections of Notebooks. Some GTD Evernote practitioners use tags extensively to organize their system. I only use tags sparingly and really only use two tags – “Today” for the next actions I am planning on doing today and “Weekend” for next actions I plan on accomplishing over the weekend. Tags are attributes that you can apply to any individual note. You can then view all notes with a specific tag, regardless of which notebook it resides in. This provides for the ultimate in filing flexibility and many people prefer to use tags as the basis for their system instead of notebooks. I do not use tags because of the extra steps (clicks or touches) it takes to tag the item introduces friction into the capture and processing processes. I don’t distinguish between work stuff and personal stuff for the same reason I do not use tags – I do not want additional clicks or touches when capturing or processing my stuff. Don’t confuse a context like @home where the next physical action can only be done at home with “personal” as in separating work stuff with personal stuff. In GTD, there is no distinction between business and personal – it is all “stuff” you need to do and it needs to get into your trusted system. In today’s world a significant amount tasks, action items, projects and other stuff are going to come to you via email. Fortunately, Evernote has a friction-free way to handle this. Each Evernote account is assigned a unique email address. You can find this in the desktop version of Evernote under Evernote – Account Info. Your email address will look something like this “username.c12345@m.evernote.com” and you should add this address to your contacts. I created a new contact called, “Inbox” and assigned this email address to it. Now when I want to send a message to Evernote, I simply forward it to my Inbox contact. The beauty of Evernote is it’s friction-free ability to get “stuff” into Evernote so you can process it later and ensure you never forget anything that is actionable. This is critical to having a Trusted System and the stress-free productivity that goes with it. 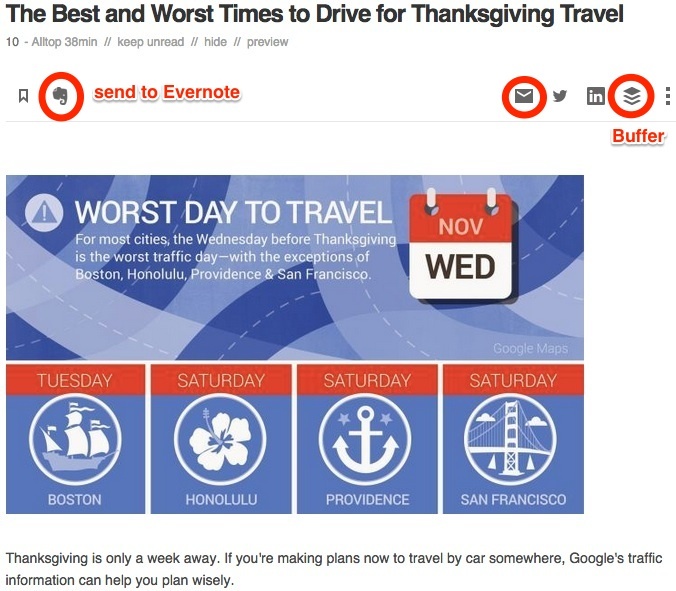 If I see an actionable item when reading RSS feeds in Feedly, I just click on the send to Evernote icon. If I come up with an idea or someone tells me something actionable, I use Fast Ever to input it via text. All of these way to capture stuff end up with new actionable items waiting for me in my Unprocessed folder ready to process into the appropriate action and context for that item. 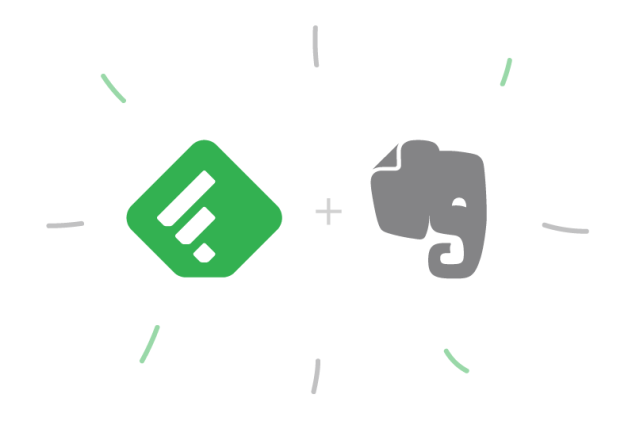 I can’t think of a better way to have a friction-free way to getting stuff into my trusted system than using Evernote. And for this reason, Evernote has become the most important application I have on all my devices. That’s it. My Trusted System that runs my entire life is in this simple yet powerful tool called Evernote. If you really want to resolve to accomplish something and truly make a commitment with yourself, then you need to create an environment for long-term success. This means adopting GTD and incorporating your desired outcomes into your trusted system. I recommend you do a “Yearly Review” to reflect on last year and project into next year. Then if something comes out of that self-reflection that you really are willing to commit to, you need to incorporate it into your system and work your system every week via the Weekly Review. By using this approach (as opposed to a new year’s resolution) you will have a much better chance of long-term success. What is your unfinished business from this year that will carry forward to 2014? What did you give back to your community? Next, it is critical to assess how you have allocated your time over the course of the last year. This is critical because time is your most valuable asset. There are only 24 hours in a day and therefore you need to make the most of each one of those hours. To complete my Year-End Review I schedule my calendar for the new year. I schedule all of my recurring meetings to stop recurring at the end of the year so I will have a blank calendar in the new year. This way I get to reassess the value of those meetings. Do a Year-end Review and I guarantee you will feel better and start 2015 off on the track to success! In my last post, I discussed that as a CIO in today’s fast-paced world it has become increasingly difficult to stay on top of all the relevant news and information I need to be successful in my job. 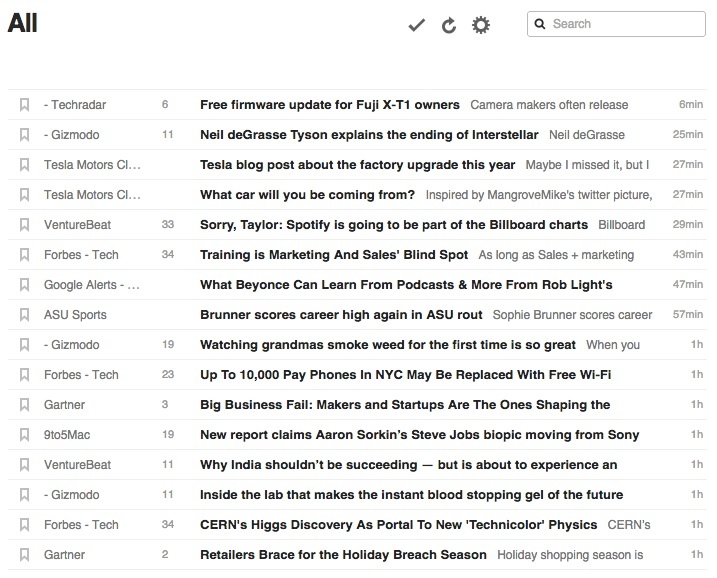 I explained how I use Feedly to process hundreds to headlines per day with ease. Unfortunately, not all content I need to stay on top of my game comes as a RSS feed or the sources do come as RSS feeds but they are to “spamy” to consume that way. So, I use additional digital tools like Apple’s Newsstand & Podcast apps, and Amazon’s Kindle & Audible apps to augment Feedly. 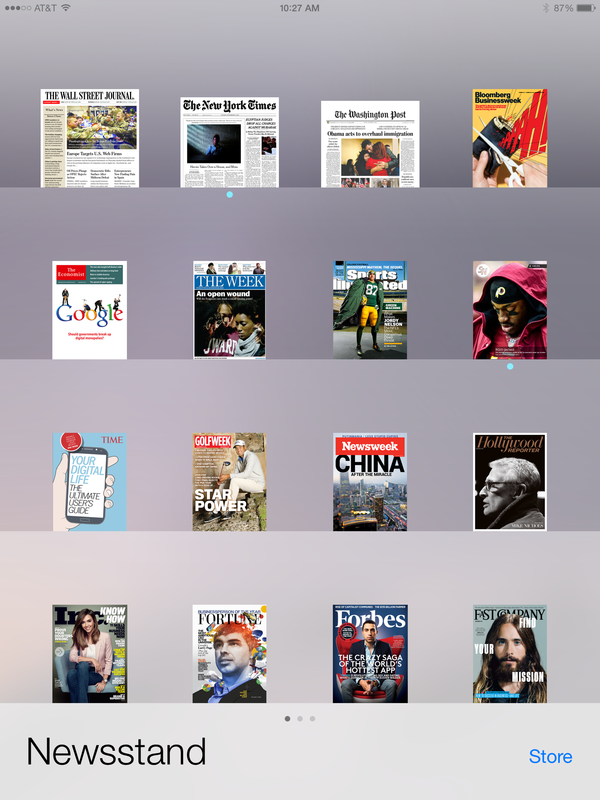 Every morning I read the daily newspapers like Wall Street Journal, New York Times, and Washington Post on my iPad before I go thru my Feedly feeds. Why? Because the WSJ is the source for business, the NYT is the national paper of record, and the WP is the source for political and world events. With the digital versions I can scan the entire paper in less than 3 minutes and drill down on any stories that interest me. Now, I have all the relevant information from the analog paper world that matters in less than 10 minutes. No way you could do that with the dead trees versions! Some content is only available on podcasts so that is how I consume it. Generally, I listed to podcasts in one of two situations. either I am at the gym doing resistance training and stretching, or I am in the car on my daily commute. 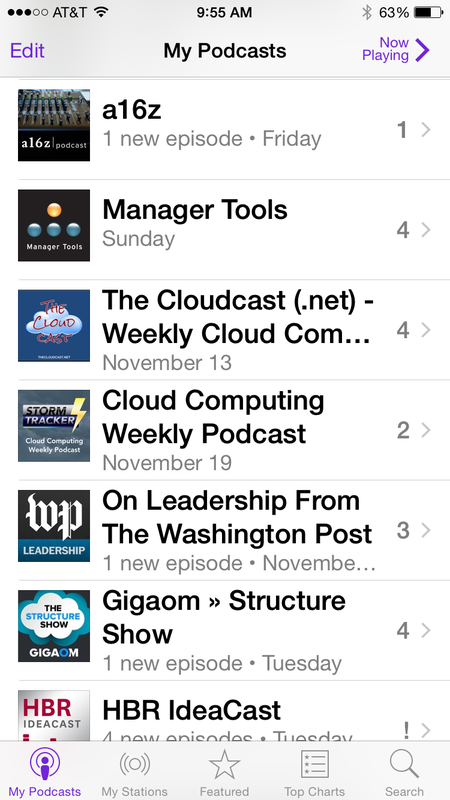 There are some wonderful tech podcasts like A16Z, The Cloudcast, Cloud Computing Weekly, Gigaom Structure Show, and McKinsey on High Tech podcasts. There are also some great business and management podcasts like Manager Tools, Career Tools, On Leadership from the Washington Post and HBR Ideacast. I like to listen to Freakonomics Radio just to get the weird and humorous side of things. And finally, I listen to productivity casts like GTD Connect, GTD Virtual Study Group, The Productive Life, Beyond the To-Do List and This is Your Life with Michael Hyatt. Audible audiobooks is another way to keep up with “reading” books by listening to them. I usually listen to audiobooks in the car and really enjoy it. I can fly thru a book relative to reading it because I have more built-in “listening time” than I do free “reading time” built into my week. Just commuting to work gives me 5 hours a week to listen. Audible has a great business model where you buy credits and exchange them for books. The net effect of this is you get books that you want to “read” in such a way as to encourage you to get a new book every month. This encourages you to keep listening to new content at a fairly rapid clip in order to use your credits. Like you would expect from Amazon, Audible does a great job of data analysis from your wish lists and previous purchases from both your Kindle and Audible accounts to recommend titles on sale that you really want. Some books are not available on Audible and are only available on the Kindle. For these types of books and for pleasure reading, I tend to get the Kindle version. I like the ability to read them on my Kindle Paperwhite reader when I am lying in bed because it is so light or outside in the sunshine when the glare on my iPad makes it difficult to read. Amazon bought a web site called GoodReads which is a social network for people who love to read. Amazon has done a good job of integrating Audible, Kindle and GoodReads so GoodReads knows about your purchases and can automatically import them. When I hear about a new book to read I add it to my “To Read” shelf and then when I am ready to read/listen to a new book I just go to GoodReads to see what my next purchase should be. Because it is social, you tend to follow other readers and get recommendations and reviews that enhance the experience. This is one are where the wisdom of the crowd really helps. The one common thread between Feedly, Newsstand, Podcasts Audible and Kindle is once the content makes the shift from the analog world to the digital world, it becomes much easier to consume content faster and more efficiently. This is critical for keeping up with today’s fast paced world.